It is possible to call Krakow without exaggeration one of the most beautiful cities of Europe. Full of historical sights, Krakow is included into the list of world heritage of UNESCO. Learn also you about the best architectural instructions and remarkable places of Krakow in our article. Krakow – is full of interesting legends and beautiful landscapes – the city on the left coast of Vistula. For the centuries-old history he managed to turn from the pretty town into the cultural and economic center of Poland. With XIV on the 17th a century Krakow was the capital of Poland and even the place of crowning of kings. This period is also the main thing in a development of the city and constructions of amazing sights which reached us practically in original state. Presently Krakow is “the cultural capital” of Poland and one of the most popular centers of tourism. At the beginning of the 16th century the king Sigismund I invited the best domestic and foreign artists (the Italian architects and sculptors, and also the German decorators) to create the magnificent lock in style the Renaissance which would be the best in the country. It happened as Sigismund I conceived, the Vavelsky lock became the best in Eastern and Central Europe. The huge yard with graceful arches and faultless proportions made this sight of Krakow the best place for providence of large-scale royal actions and even knightly tournaments. To tourists suggest to visit personal rooms of an imperial family and to see refined interiors of the Vavelsky lock of Krakow in combination with beautiful ancient furniture and numerous objects of art of a world class. It is interesting to know that up to now the sight reached practically in original state therefore all tourists of Krakow need to visit the castle. This unique place of Krakow is one of the most known and most popular tourist sights of Poland. The Vavelsky cathedral hundreds of years were the place of crowning and burial of the Polish monarchs. Since the 14th century in its territory also the set of the first-class works of art of a gothic style, the Renaissance, baroque, classicism and a modernist style settled down. 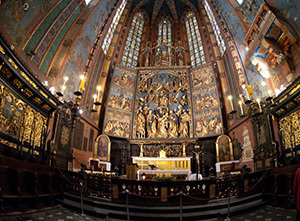 However tourists from around the world go to Krakow to look at magnificent medieval chapels of the Vavelsky cathedral. The real work of art is the chapel of the king Sigismund. It enjoys popularity among guests and residents of Krakow. When in round you visit this sight, surely rise by a belltower. There you are expected a huge 11th ton bell by Sigismund whose ring you can hear only for the main holidays of Poland. You can visit a cathedral absolutely free of charge, however in the building of sight the Cathedral museum for which visit it is necessary to acquire tickets is located. Since 1257, the Central market square was one of the biggest in medieval Europe. Centuries later, it still remained the most brisk and crowded place of “the cultural capital”. Here traditionally there is a lot of to people: the locals wishing to communicate or just to have a rest, crowds of the tourists photographing everything that only perhaps around themselves. This only noisy and very crowded place in quiet and peaceful Krakow. The area surrounded with historical buildings, the museums and beautiful churches impresses with the huge space. Recently the market square of Krakow became the real center of commercial and public work of the city. Part of this unique place are flower sellers, trays with ice cream, street musicians and packs of pigeons who are constantly fed up by locals. It is necessary to visit this sight to all tourists of Krakow. Krakow has the analog of the Tower of Pisa. This sight would not become such popular among tourists if not its similarity to a tower in Pisa. Of course Town Hall tower cannot be compared with Pisa, its inclination makes only 55 cm. But because of the big height (70 meters), this rather small inclination very much it is well noticeable – it is and attracts crowds of the tourists wishing to be photographed surely on its background. Goes many legends telling about a mysterious inclination of the Town Hall tower, however the only correct explanation is the fact that in 1703 strong wind caused a small deviation of a tower. Since then the tilt angle slightly increases. The sight is located on the Central square of Krakow so you cannot find this popular tourist place. Surely visit this unique analog of the Tower of Pisa. In such quiet and peaceful city as Krakow besides fine sights is still a set of night institutions where it is possible to have a rest and relax well. “The cultural capital” can brag of a huge number of small night clubs that does it also “the club capital” of Poland. Each club can accomodate at most 100 people, but there are quite enough clubs to have a rest with all the heart to the resident of Krakow and tourists. The majority of institutions round the clock work not only on the weekend, but also on weekdays. Besides discos night bars, cafe and even restaurants enjoy wide popularity. It is interesting to know that the most popular and big clubs are in the quiet historical district of Krakow – the Old city. Here are always glad to tourists and visitors. By the way, local DJs became very popular far behind borders of Poland so it is possible to tell safely that discos already became presently the integral sight of Krakow. Krakow – the city of unsurpassed sights and unique tourist places. In our article you learn interesting information on historical monuments and sights of Krakow.